Being located in the adjoining areas of Bay of Bengal, how can West Bengal be left behind in the terms of beaches and natural beauties? All these alluring and pacifying beaches are located in the vicinity of Kolkata and hence, are easily accessible by road. So, how about exploring the unexplored beaches of Shankarpur this season? Ranging from cleanest beaches to uncrowded beaches, you can find everything around Shankarpur. If you have been looking to take a break from Kolkata for months, then here is your destination. It's time to pack your bags and be on the road leading to Shankarpur. Read on to know more about this beachside hamlet and how to plan a trip from Kolkata to Shankarpur. Shankarpur is a year-round destination and hence, can be visited throughout the year. However, if you are looking forward to avoiding the heat of the summers, then the best time to visit Shankarpur is from September until the end of March, as, during this period, the climatic conditions are favourable. By Air: The nearest airport is at Kolkata, which is located at a distance of around 184 km from Shankarpur. By Rail: You can catch a direct train to Ramnagar railway station which is at a distance of about 5 km from Shankarpur. From the station, you can hire a taxi to the main town of Shankarpur. By Road: Shankarpur is well connected by road to nearby cities and town. It is situated at a distance of 184 km from Kolkata. Route 1 is preferable as it will take 30 minutes lesser in comparison to route 2. Through route 1, you can reach your destination within 4 hours. Once you have embarked on your journey to Shankarpur, you can take a break at the following places. If you are looking for a break en route to Shankarpur, then Tamluk is the perfect place. Located on the banks of Rupnarayan river at a distance of 91 km from Kolkata, this ancient town has a lot of things to explore. From old temples to its river beach, you can unveil all its small wonders. You can also opt for boating and swim in the relaxing waters of Rupnarayan river. So, how about a break in the midst of the lush green surroundings of Tamluk? Located at a distance of around 26 km from Shankarpur and 150 km from Kolkata, Contai is believed to be one of the oldest settlements in the state of West Bengal. There are several ancient monuments in Contai, ranging from temples to mosques. Apart from its historic buildings, it is also popular amongst locals for its cashew nut and salt industries. Kapalkundala Temple and Basanti Mandir are a few ancient places to visit in Contai. Shankarpur is a tiny beach hamlet which is located at a distance of just 14 km from Digha, which is another beach resort town. Due to the presence of beaches which are less crowded in comparison to the famous beaches in West Bengal, Shankarpur is gaining popularity day by day. It is located in the East Medinipur district of West Bengal and is an idyllic destination to relax your mind, body and soul away from the noise of the city life. There are several beautiful beaches in and around Shankarpur which will certainly compel you to stay here for a longer period of time. Well, following are the major beaches which must be visited by every tourist in Shankarpur. Who wouldn't love to spend their weekends amid silence and nature? If you are looking to sit idly and gaze at the natural beauties on the shores of West Bengal, then Shankarpur Beach is definitely a place which must be on your bucket list. With the shoreline dotted with green trees, Shankarpur Beach is a perfect place to detox yourself. Digha Beach is one of the most visited beaches in and around the region. Hence, during the peak season, you can find this pristine beach crowded with hundreds of tourists and visitors. 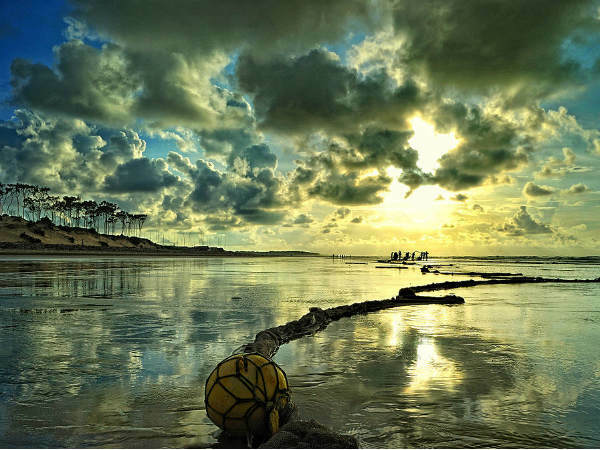 It is located in the beach town of Digha and is also one of the cleanest and well-maintained beaches. You must visit Digha Beach if you love being lost in the ecstasy of nature while savouring its beauty under an open and clear sky. Another beach which might give you the feel of an unblemished atmosphere is Mandarmani Beach. It is located at a distance of around 20 km from Shankarpur and certainly deserves to be visited on account of its spectacular views at the time of dawn and dusk. Hence, you can find several photographers here capturing the captivating beauty of Mandarmani Beach, extending till the horizon and beyond.